My mother in law when she visited our house for the first time to see her future daughter in law i.e. me enquired of my favourite food and my immediate response was "Egg". 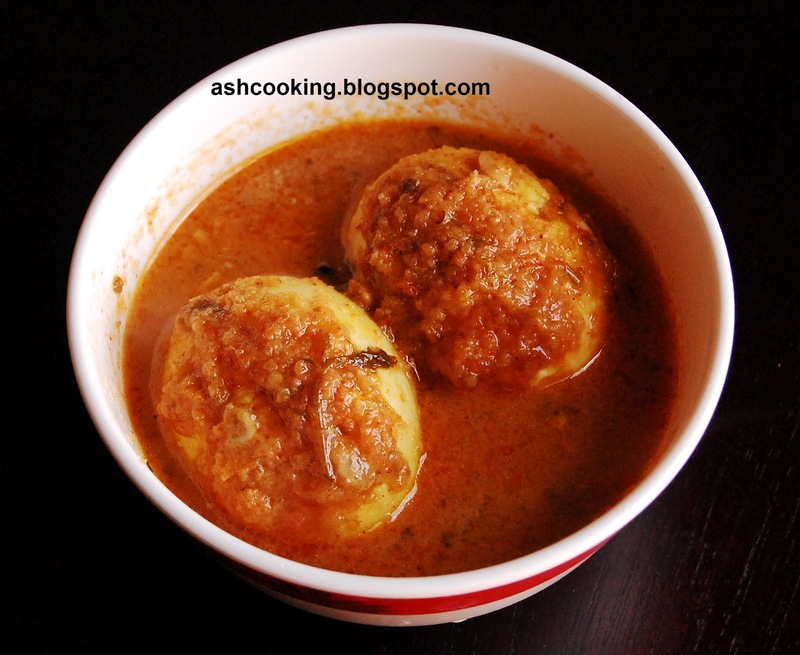 Frankly, egg is my all-time favourite food and I love experimenting with its preparation. I slightly twisted the below Egg Butter Masala recipe, originally showcased in a Bengali cookery show, to suit my own taste bud. The outcome I came up with was brilliant. A must have for all egg lovers. 1) Grind onion, tomato and green chillies into smooth paste. 2) Rub a bit of salt on the eggs and shallow fry them in smoking hot oil till they are golden brown in color. 3) Into the same oil, add the ingredients for sauté and allow them to sputter. 4) Add onion, tomato and green chilli paste. Shallow fry. 5) Add garlic paste, melon seeds and kashmiri red mirch. Sauté for 10 minutes till oil leaves the sides. 6) Then pour the parmesan cheese diluted in milk into the curry. Add coriander leaves and the butter. Add 1/2 cup of water. Bring it to a boil. Add salt and garam masala powder. 7) Slide in the fried eggs. Serve hot with roti or rice.